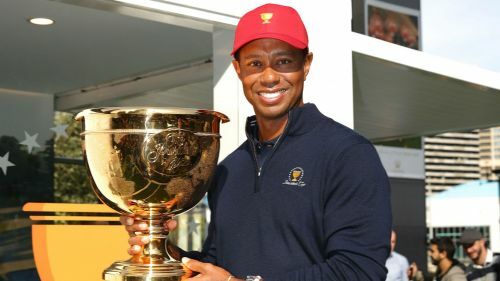 Tiger Woods poses with the Presidents Cup trophy. Tiger Woods is yet to formalise his 2019 schedule but has no intention playing in as many tournaments as this year. Having started 2018 unsure how often he would be in action, the former world number one enjoyed a fabulous comeback to the PGA Tour, including winning his first title in five years at the Tour Championship. Woods also recorded top-10 finishes at the last two majors of the season, though his success came at a price as he was left "worn out" by the time the Ryder Cup came around, leading to him failing to pick up a point at Le Golf National. Now more certain about his physical fitness after overcoming a serious back problem, the 42-year-old wants to cut back over the next 12 months so he can remain fresh throughout. "I certainly won't play as many times as I did last season," Woods confirmed at a media event in Melbourne for the Presidents Cup. "At the beginning, if you'd have asked me if I would get through all the play-off events I didn't even know if I'd qualify for them. That was something I had not trained or planned for, and you saw at the end of the year I was worn out. "Trying to pace myself next year and do a better job of that, with an entire 12 months, hopefully I've learned my lessons." While he may not feature so often, Woods wants to build on his success at East Lake by contending more often. Asked if he has set the bar higher, he replied: "Yes, because I didn't know what I was going to do this year, whether I'd make it to the Florida swing, or how many majors I was going to play. That was all just fluid and trying to figure it out on the fly. "Next year is a different thing – I understand what my body can and cannot do. I have a better understanding of how to train and my swing has evolved throughout the year, as well as my equipment. "Everything got better throughout the year and by the end of it I was playing my best golf."